1. A 200-gram ball, attached to the end of a cord, is revolved in a horizontal circle with an angular speed of 5 rad s-1. If cord’s length is 60 cm, what is the centripetal force? The centripetal force is the resultant force that causes the centripetal acceleration. ∑F = Centripetal force, m = object’s mass, v = linear velocity, ω = angular velocity, r = radius. 2. A stone attached at the end of a cord and rotated in a horizontal circle by a student. 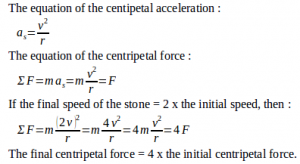 If the final speed of the stone = 2 x the initial speed, then what is the centripetal force. 3. A curve road of radius R is designed so that a car traveling at speed 10 ms–1 can negotiate the turn safely. The coefficient of static friction between car and road = 0.5. What is the radius? 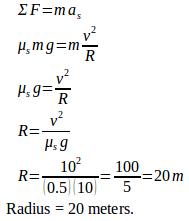 Acceleration due to gravity (g) = 10 ms–2. 4. The coefficient of static friction between tire and road is 0.4. If acceleration due to gravity is 10 m/s2, what is the maximum speed so the car can turn without skidding out of a curved path. Centripetal force is the net force which produces centripetal accelerations. In this case, the centripetal force is the force of static friction.